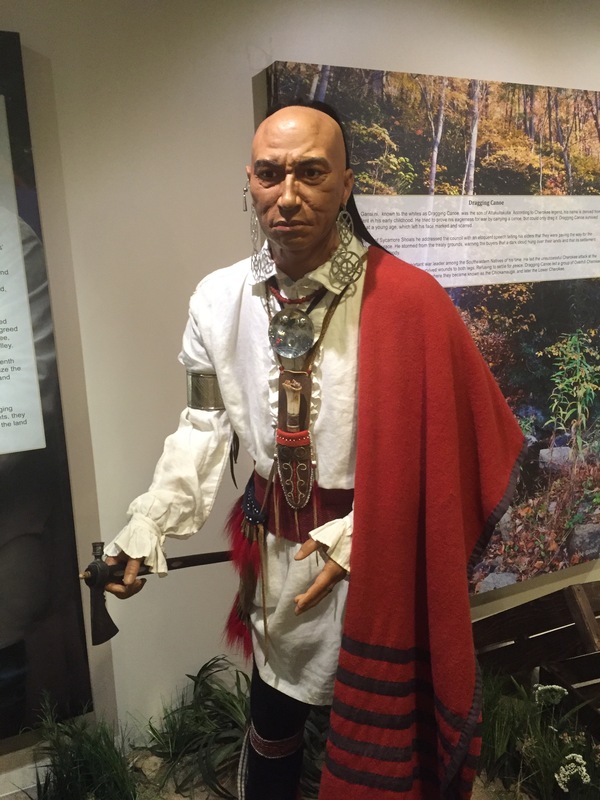 I finally got to see the updated visitor center exhibit at Sycamore Shoals State Historic Park. 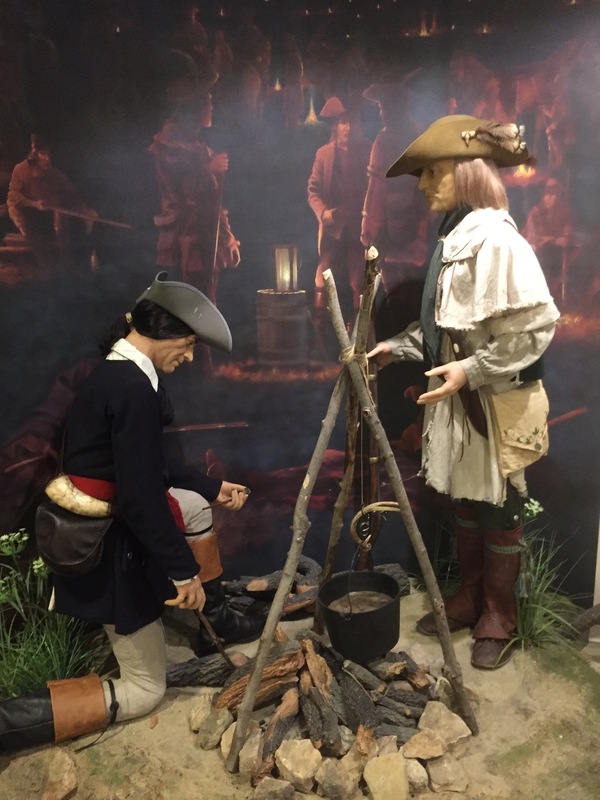 The exhibit narrative offers a pretty good crash course in the history of Tennessee’s Revolutionary frontier, using some lovely murals, audio, artifacts, and a few tableaux with life-sized figures. 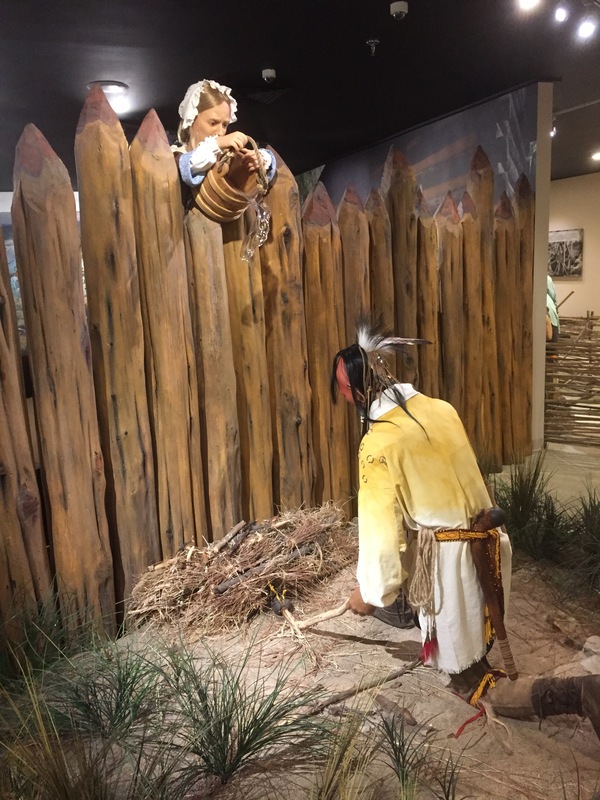 You can stand eye to eye with Dragging Canoe while listening to an audio dramatization of his speech denouncing the Transylvania Purchase. He delivered these remarks in March 1775, just a short distance from where the exhibit gallery now stands. When Cherokee warriors launched an assault on the settlements in July 1776, one prong of the assault struck Fort Watauga. Here’s Ann Robertson employing a little frontier ingenuity, using scalding water against a warrior intent on setting fire to the fort’s wall. Of course, another important moment in the history of Sycamore Shoals came in late September 1780, when the Overmountain Men mustered there for the march that took them to King’s Mountain. 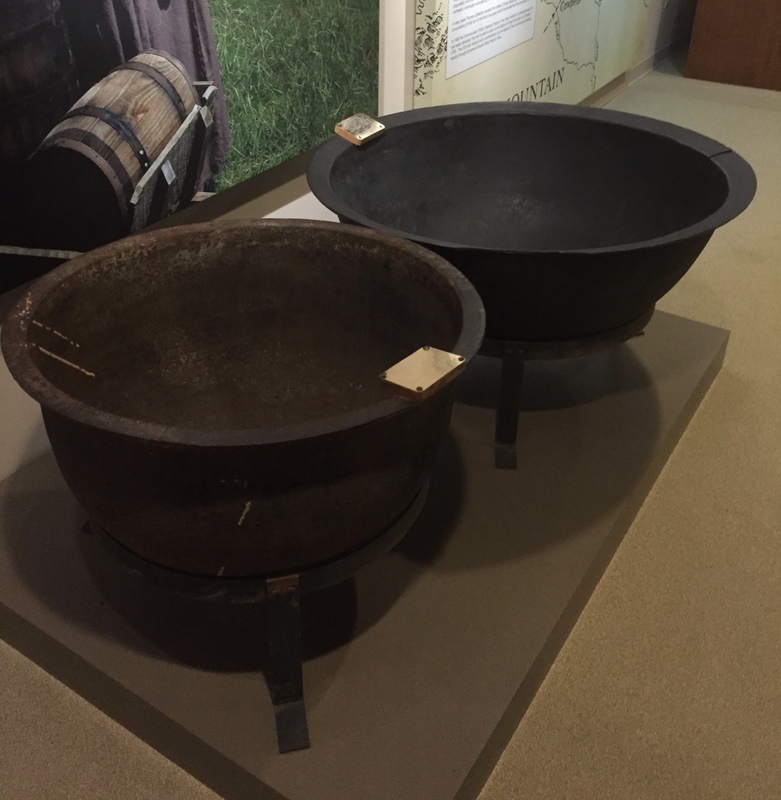 In terms of original artifacts, the highlight is this pair of kettles from Mary Patton’s gunpowder mill. Born in England, Patton lived in Pennsylvania before migrating to the Watauga region with her husband. The Pattons’ mill supplied five hundred pounds of gunpowder for the King’s Mountain expedition. I think these material links to East Tennessee’s Rev War years are pretty darn special. If you wanted to identify one site as ground zero for Tennessee’s frontier era, Sycamore Shoals would be as good a spot as any. It’s nice to see the place get the sort of modern exhibit it deserves. …is the city. Los Angeles, California. It’s a big city—with the second highest population of any metropolitan area in the nation. Nearly four million people call this place home. With that many people, you can support a lot of museums. It was Monday, June 20. It was hot in Los Angeles. We were working the day watch out of the sightseeing division. My former classmate and longtime friend is Dustin. My name’s Michael. 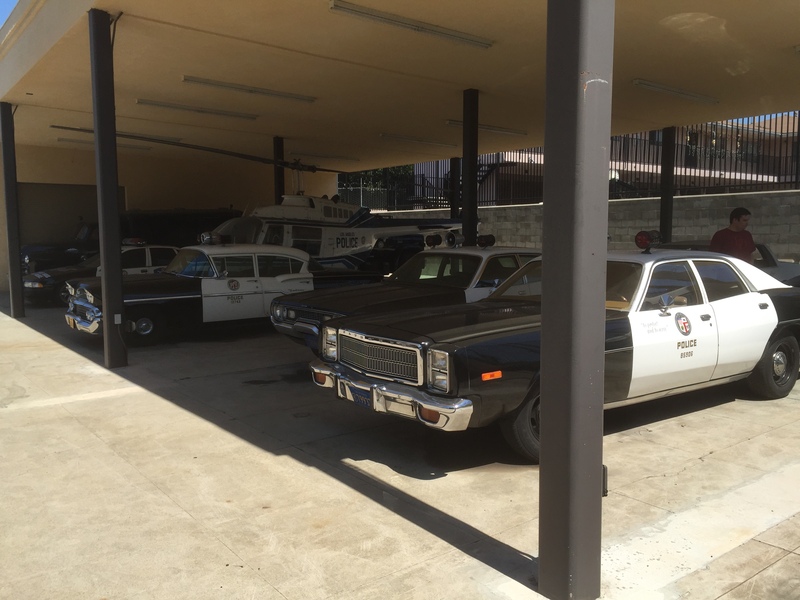 We’d decided to check out the Los Angeles Police Museum located in the old Highland Park Police Station, the oldest station building in the city. Constructed in the 1920s, it’s currently on the National Register of Historic Places. We arrived at 9:42 a.m. The door was locked. The museum didn’t open until 10:00. Without a warrant, we couldn’t barge in and search the place. We headed across York Boulevard for breakfast at a Coco’s Bakery. The service was slow, but the eggs weren’t bad. 10:38 a.m. We walked back across the street and paid admission. A small hallway by the front desk featured images from the LAPD’s early history and informative signage, along with numbered guideposts for the audio tour. 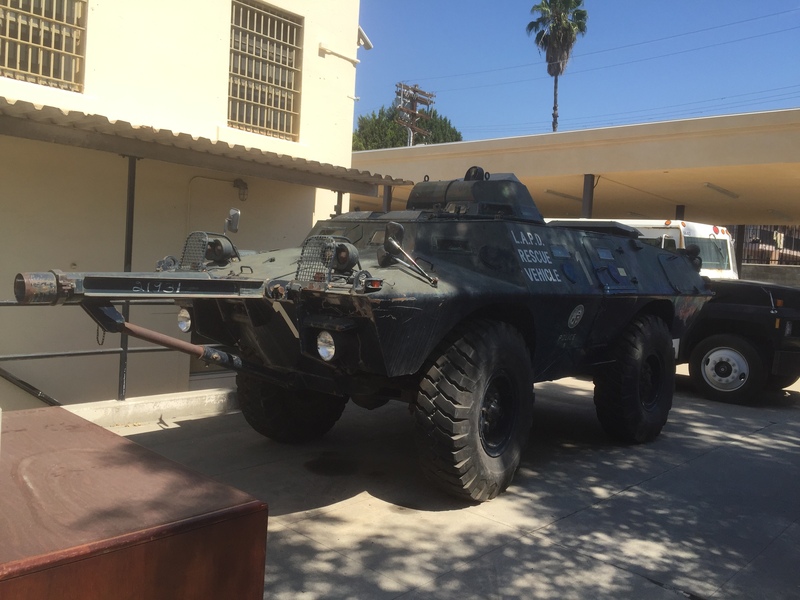 The museum boasted an extensive collection of historic police armaments and other paraphernalia relating to law enforcement. The first exhibit case was full of old billy clubs. 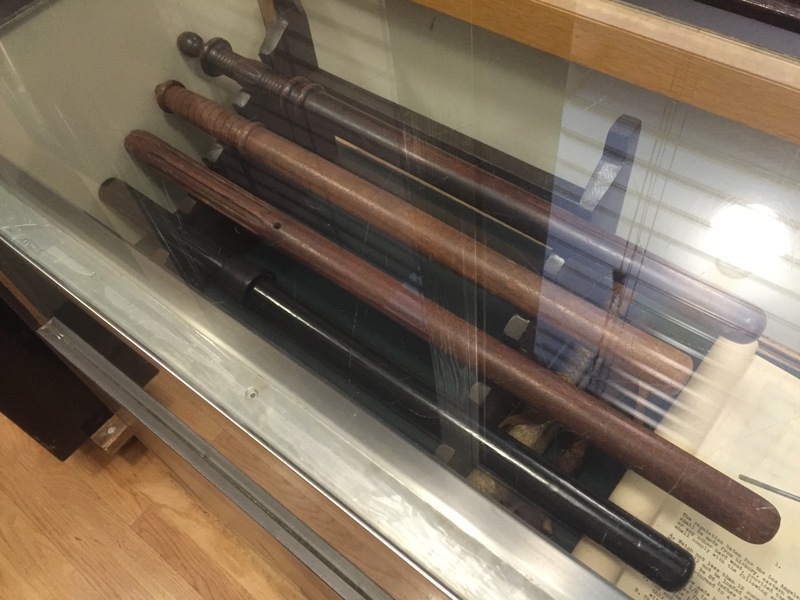 Since the weapons were under glass, we were unable to check for prints. 10:47 a.m. 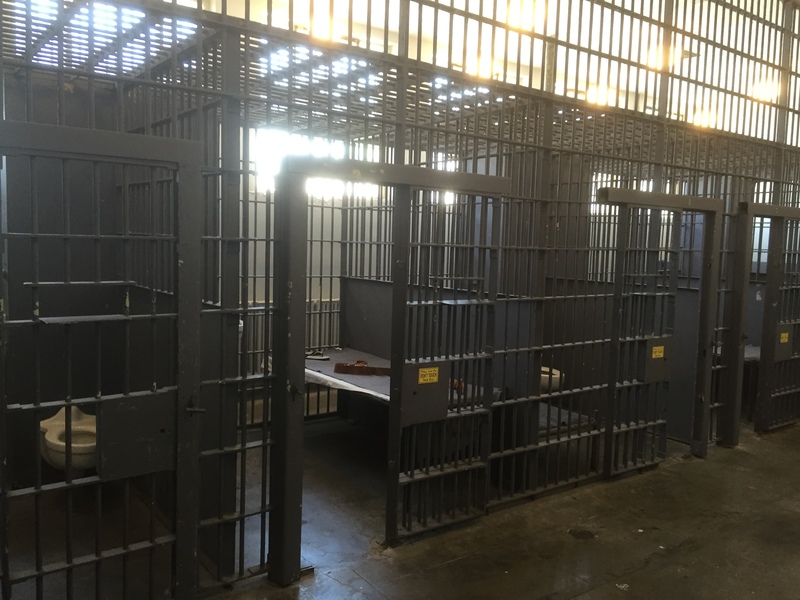 The Highland Park station’s misdemeanor holding cells were still in place. The doors were open, and from the look of things, the inmates had used the opportunity to make their escape. We determined to keep a look out for any suspicious characters. …to older model police cars and a helicopter. 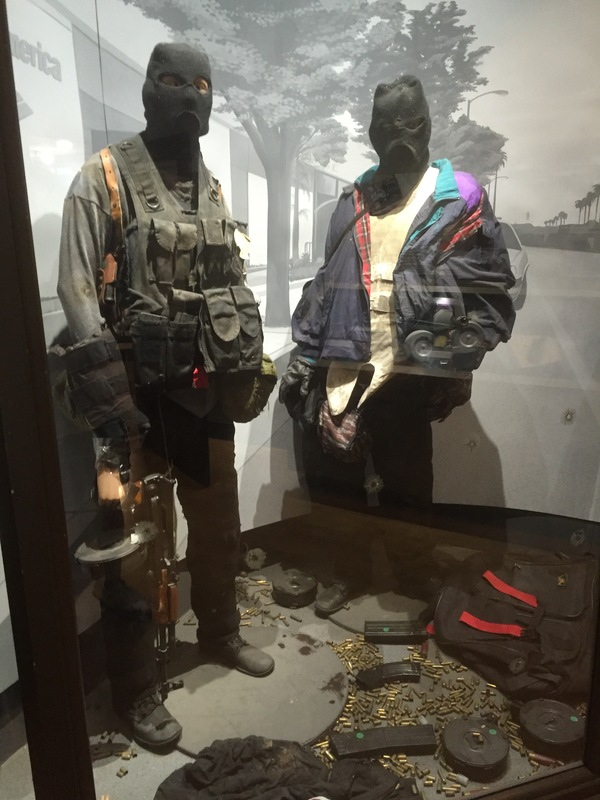 The exhibit also included two vehicles involved in the 1997 North Hollywood shootout. 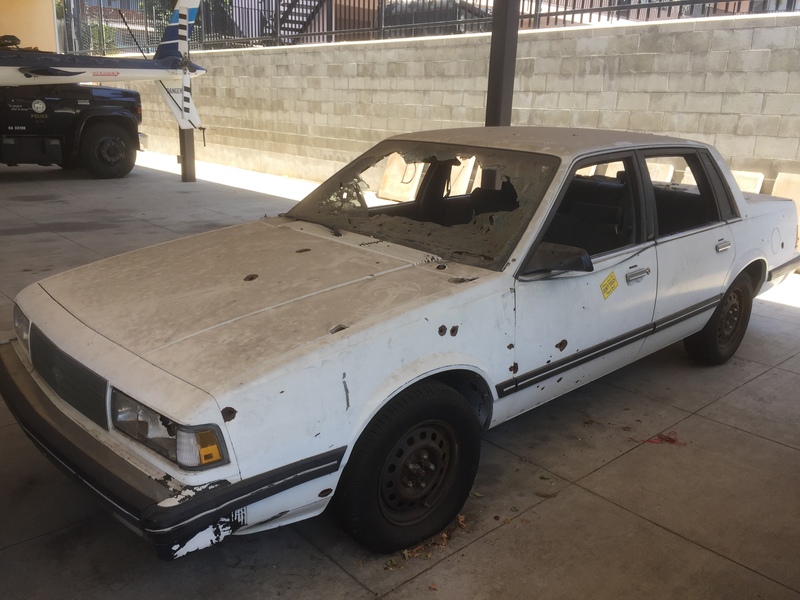 The bank robbers’ getaway car had sustained damage from gunfire and a broken windshield. Driving with a damaged windshield is a violation of Section 26710 of the California Vehicle Code. We left a citation on the dash. 11:26 a.m. We headed upstairs. 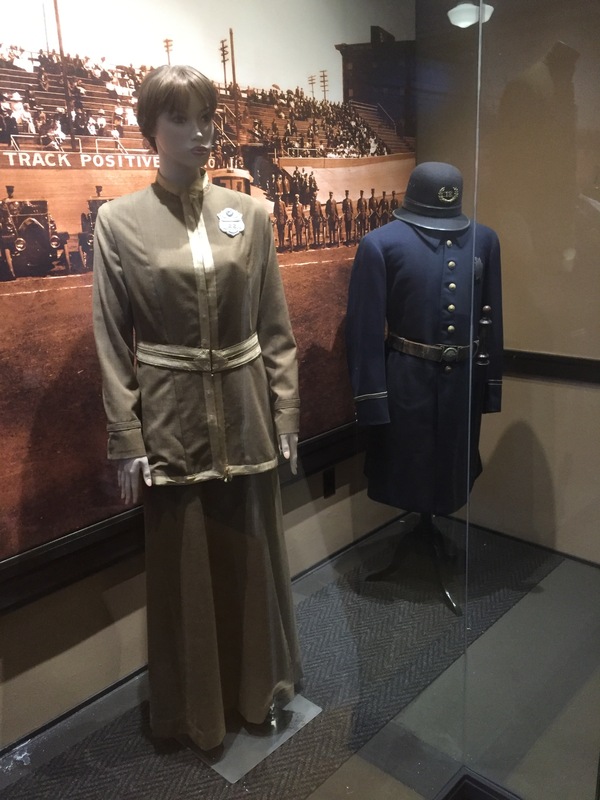 Vintage LAPD uniforms dating back to the late nineteenth century were on display on the museum’s second floor. 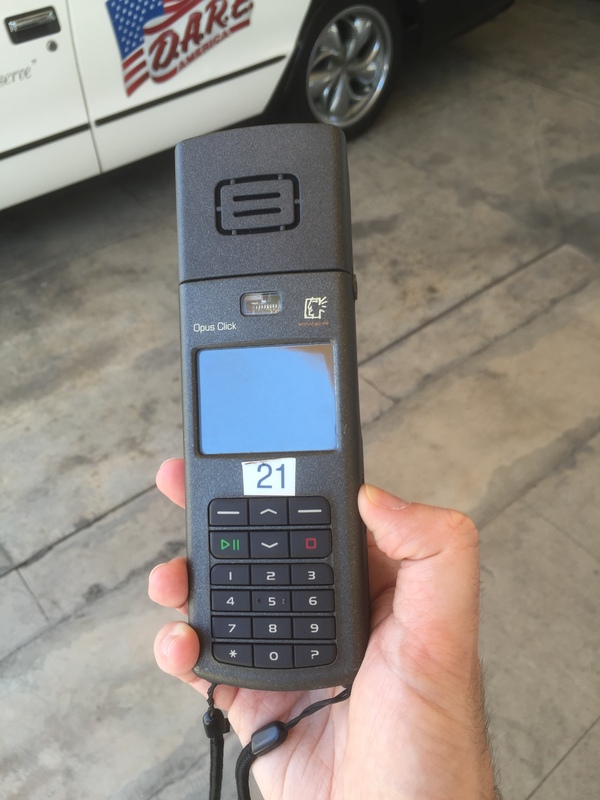 …and another on the North Hollywood robbery. We attempted to interview the two perpetrators. Being mannequins, they were uncooperative. 12:14 p.m. We took the elevator downstairs to the gift shop, where I picked up a copy of the authorized biography of Jack Webb. 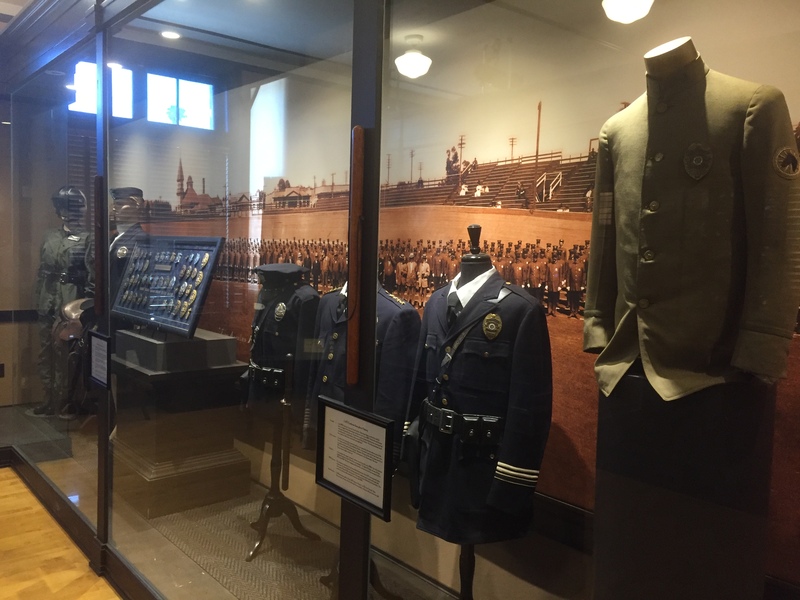 We concluded that the Los Angeles Police Museum is one of city’s more interesting historical attractions, and well worth a visit if you’re in the area. The movie’s not out yet, but one thing’s for sure: Gary Ross, the writer and director of Free State of Jones, is a guy who takes history seriously. In advance of the film’s release, on June 24, Mr. Ross, whose credits include “Seabiscuit” and the first installment of “The Hunger Games,” is posting an elaborate website annotating some three dozen topics and scenes from the movie, allowing audiences to click through and evaluate for themselves his historical sources, including many primary documents. The website’s pretty impressive. It’s not just an assemblage of short essays on various aspects of the movie’s historical background, but a scene-by-scene breakdown complete with citations to scholarly sources—I mean actual, honest-to-goodness, Chicago Manual of Style footnotes. I was already interested in seeing this movie, but now I’m really, really interested in seeing it. A few days ago I heard a radio ad for Biblical Times Dinner Theater in Pigeon Forge, TN, plugging a show that combines gospel music, Bible stories, and…wait for it…Tennessee history. This show was specially created for those of you who are fans of classic gospel music and who have an interest in the FAITH heritage of East Tennessee. You will meet great heroes of the Bible along with legends of Tennessee who took a stand for God’s Word, from Moses to Billy Graham, Noah to Davy Crockett, Joshua to Sgt. York and enjoy music legends like The Happy Goodmans, Tennessee Ernie Ford, Johnny and June Carter Cash, Elvis and more. The website’s list of “Legends of Faith from the Bible and East Tennessee” also includes Samuel Doak and Andrew Johnson. All you fellow Rev War and Tennessee frontier enthusiasts will recognize Doak as the Presbyterian minister who preached to the Overmountain Men at Sycamore Shoals before the march that ended at King’s Mountain. Andrew Johnson needs no introduction, although I confess that when I think of great defenders of the faith from Tennessee, he’s not exactly the first guy who comes to my mind. I’m assuming all these characters somehow figure in the performance, but I’m not sure if cast members actually portray them on stage or if somebody just relates information about them in between the songs. One historical figure who does put in an appearance is the Apostle Paul, because he’s the narrator. Part of me would pay good money to see Davy Crockett, Sgt. York, and Samuel Doak singing and cutting a rug alongside Moses and Noah, especially if the M.C. is a guy who wrote part of the New Testament. But at this point I think I’ll have to pass on making a reservation. I love Tennessee history, I love the Bible, I love theater, and I love a hearty meal, but I’m not sure I’d like them all at the same time. Did I hit the special dino exhibit at the McClung Museum on opening day? You better believe I did. 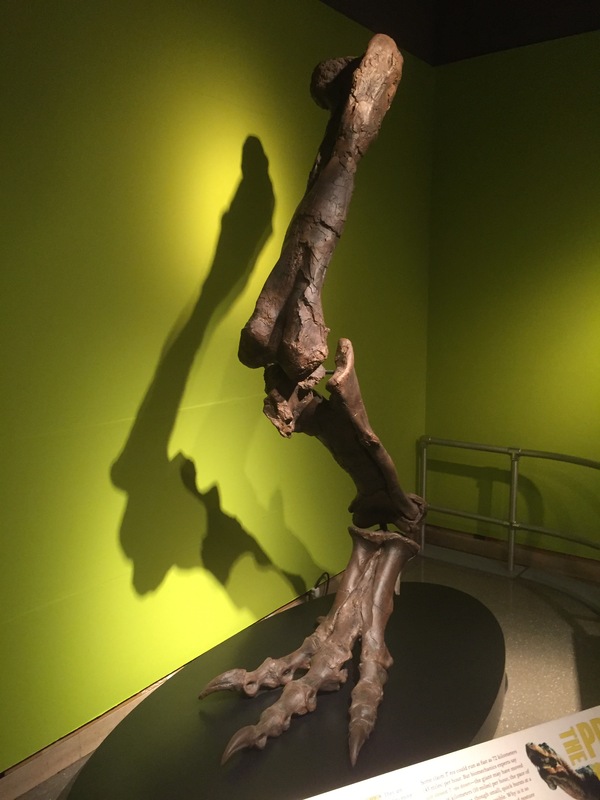 Our knowledge of dinos has increased almost exponentially in the past decade or two, partly because there are more people engaged in the business than ever before, but also because of new specimens and new techniques for studying them. New knowledge and new techniques are what the exhibition Dinosaur Discoveries: Ancient Fossils, New Ideas is all about. 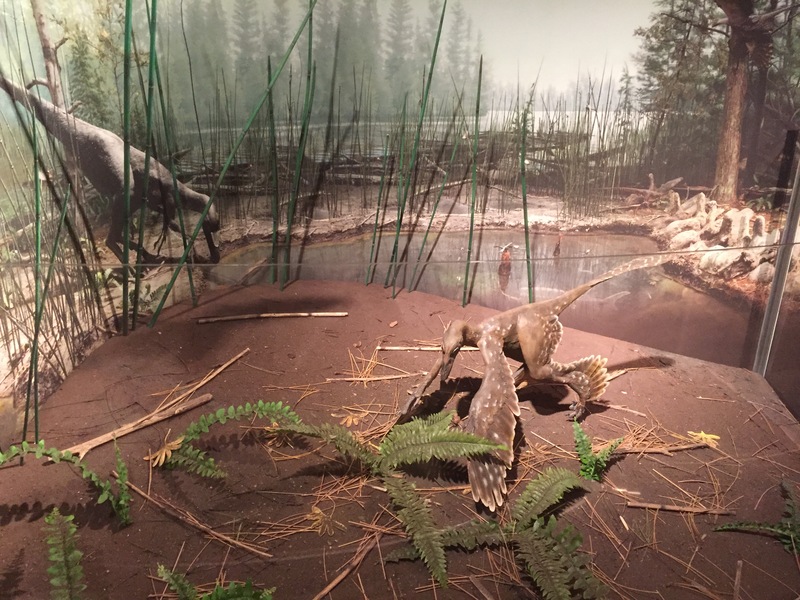 Organized by the American Museum of Natural History in New York, it offers a look at some of the things scientists have learned in the past decade or so, and explains how they’ve learned it. If you developed an interest in dinosaurs back in the heyday of the nineties but fell out of the loop later, or if you were a dino-obsessed kid who hasn’t picked up a paleo book in decades, this exhibit will give you a taste of what’s been going on lately in the world of terrible lizards. Take computer modeling, for example. 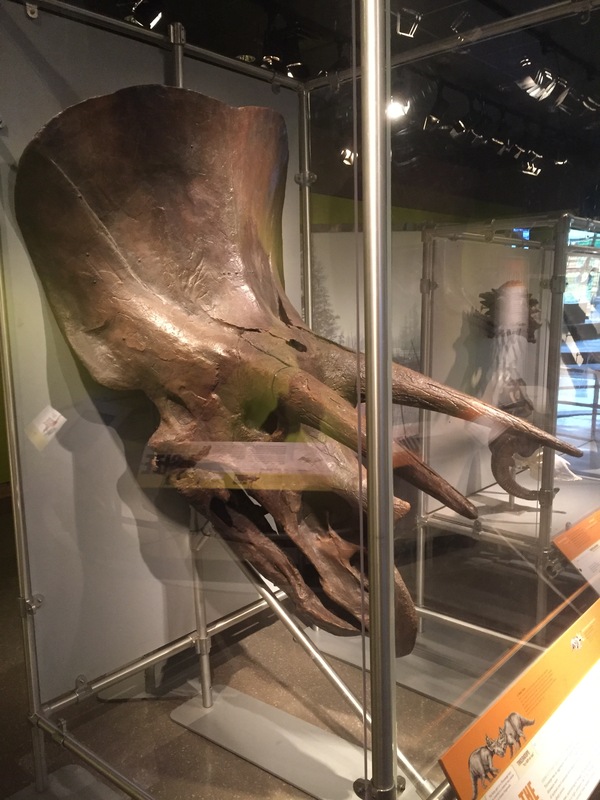 Dino bones tend to be big, heavy, and fragile, which puts limits on the things you can do with them in a lab. 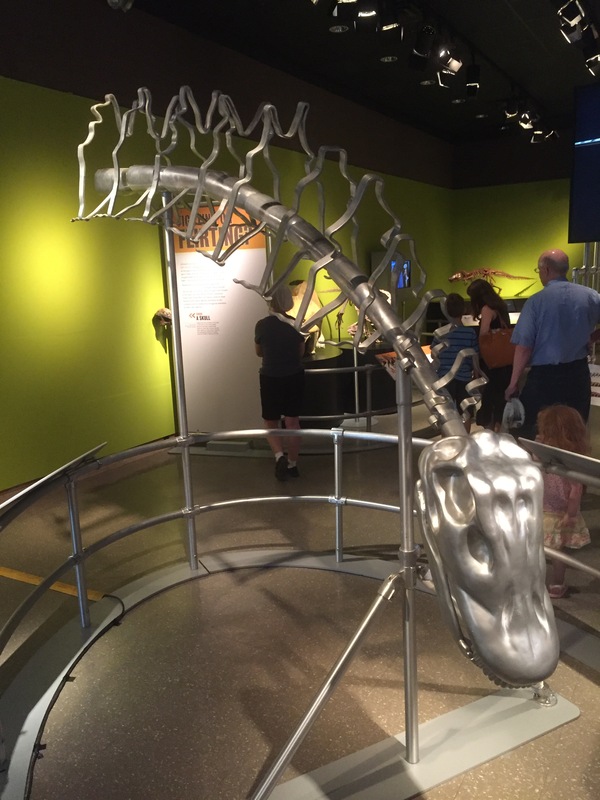 Researchers can manipulate a virtual skeleton in ways that would be impossible with the genuine article, so they can study, say, the neck vertebrae of a sauropod to get a sense of what the living animal’s posture might have been like. You know those pictures of long-necked herbivores with their heads held erect like enormous giraffes? Turns out sauropods might not have been browsing up in the treetops after all. 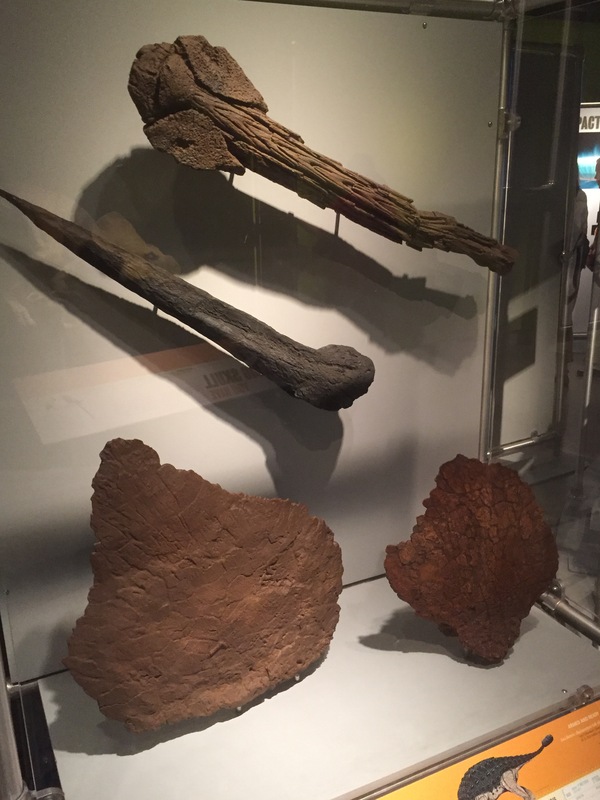 Here’s a Mesozoic arsenal: stegosaur plates and a spike, and an ankylosaur tail club. Or were some of these things intended to win over mates rather than fend off carnivores? 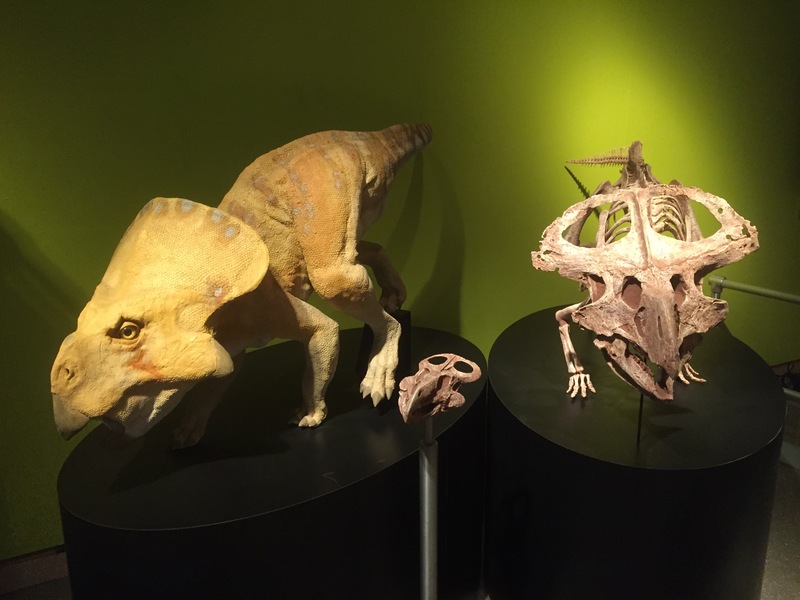 …the headgear isn’t as impressive on smaller relatives, such as Protoceratops. That suggests ceratopsians were using their cranial adornment for something besides dueling with predators. And speaking of T. rex, one of the most interesting paleontological debates involves whether the tyrant lizard king was a fast runner. (I think it’s interesting, anyway, and in the event you ever find yourself in the presence of a tyrannosaur, I dare say you’ll take an intense and sudden interest in it, too.) How do you gauge the top speed of an animal that died tens of millions of years ago? This exhibit will let you see how scientists crunch the numbers, and where the numbers themselves come from. And the news is surprisingly not that bad for those of you in the habit of driving jeeps around island theme parks during power outages. Some of the most fascinating dino discoveries of the past couple decades have come from the early Cretaceous deposits of Liaoning Province in northeastern China. Animals and plants either died in or washed into still lakes before volcanic ash buried them, creating a low-oxygen environment that kept the remains intact and preserved the fossils in exquisite detail. Because of these ideal conditions, we know that some dinosaurs from Liaoning—such as Sinosauropteryx, Microraptor, and Sinornithosaurus—had a feathery covering. These Chinese finds have shed quite a bit of light on the relationship between birds and extinct dinosaurs and the evolution of flight. 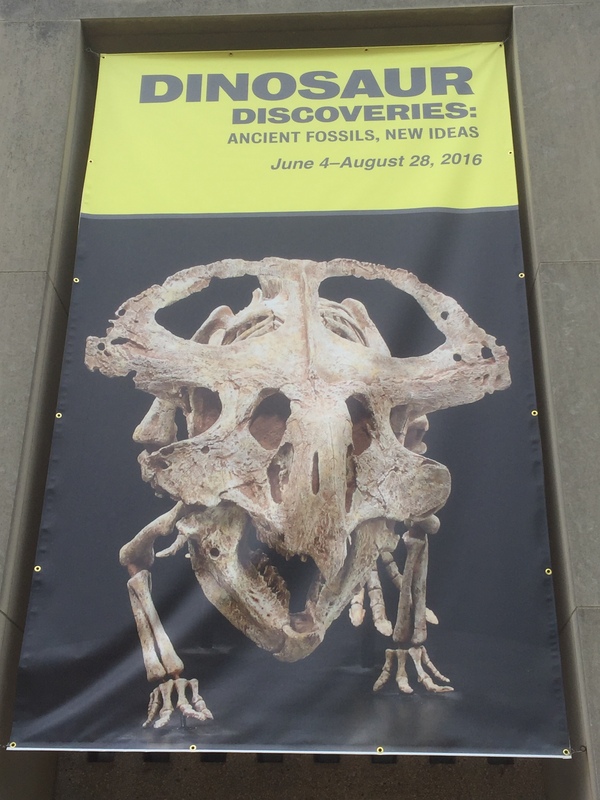 Dinosaur Discoveries will be at the McClung until August 28. I definitely recommend a visit for those of you in the Knoxville area. It’s not an assemblage of original specimens, but the casts and models are lovely, and there are plenty of interactive elements. 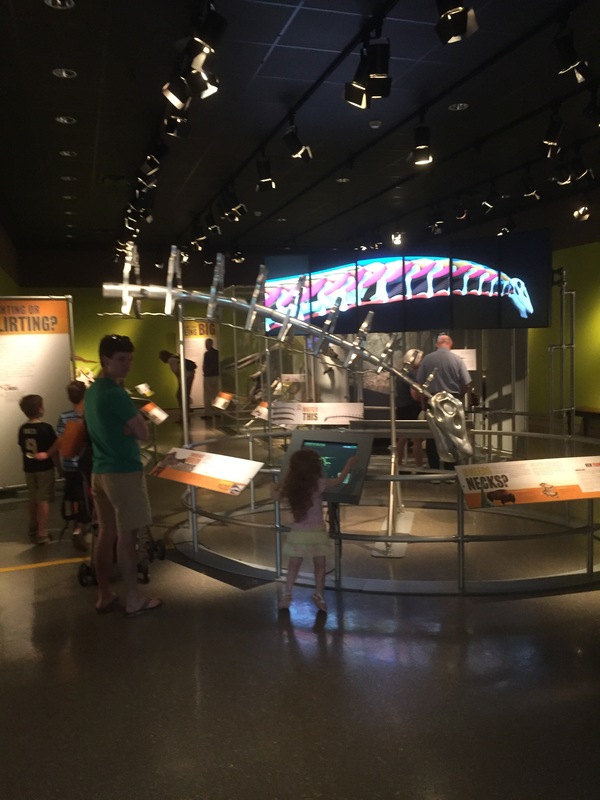 I love the idea of an exhibit geared toward teaching not just what scientists know, but how they know it and how much remains to be determined. It underscores the idea of science as a process—as a set of questions and contested answers—rather than an inert body of facts that just appears out of nowhere in the pages of textbooks and on Wikipedia. History, too, is a process of inquiry. And I think we should more fully exploit this same approach when it comes to history exhibits and other historical media aimed at the public. One of the big problems historians face when it comes to advocating for the discipline is the fact that so many people don’t really understand what we do or how we go about doing it. 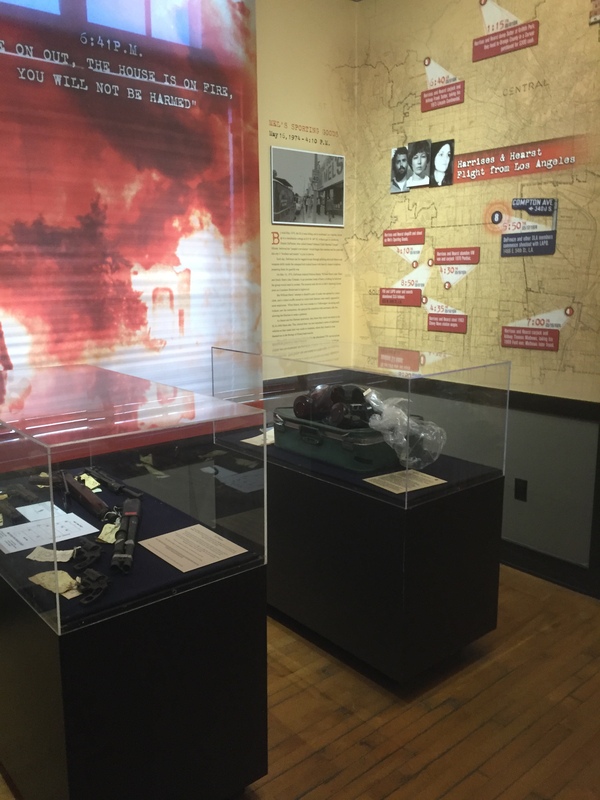 Since exhibits are one of our primary means of communicating with the public, we should be using them not just to convey information about our subject matter, but to give people a sense of how historians go about their work, what constitutes historical thinking, and what the possibilities and limitations of historical investigation are. We should be using exhibits to convey information, but we should also use them to demonstrate that this information is the result of historians asking questions, figuring out how to answer them, and throwing those answers into competition with one another.